A Simple And Brief Aquarium Guide To Get Beginners Started. When deciding to set up an aquarium it is important to think about how to approach the situation. There are so many things to think about, it might all be overwhelming at first but in the grand scheme of things having an aquarium will pay off in the end because it is a rewarding and relaxing hobby. This article is going to present some basic guidelines to follow in order to start a successful aquarium. The key is to consider all of your options and choose features that compliment one another. The first step to setting up an aquarium is choosing the types of fish you would like to keep, I said choosing, not buying. By first choosing fish you can get an idea of what type of aquarium and equipment you need. There are three main types of fish available to the aquarium hobbyist: coldwater, tropical and marine. Tropical fish live in relatively warm, freshwater and can be among the easiest to care for. Coldwater fish come from freshwaters that are colder than regular tropical fish can handle. Marine fish are saltwater dwellers and can be fairly difficult to care for. They have more water requirements and can be more demanding of your time and energy. Generally, marine fish that are available to you through retailers are warm, saltwater fish, because coldwater marine fish are harder to attain and keep in captivity. Different fish have different needs and one water parameter may be ideal for one type of fish but can possibly be lethal towards another type. The reason for this is adaptation. Species have evolved over time so that they can adapt and live in certain locations at specific conditions. Drastic changes to living conditions can place the life of a fish in peril and may result in declined health or death. Some fish that are bred and raised in the aquatic retail industry have become less sensitive to differentiated conditions yet not totally immune. When choosing types of fish you must really understand how to first take care of their needs. Live bearers such as Guppies and Platys need plenty of plants to hide in especially when giving birth to their young. Flounders need a sandy substrate in order to camouflage themselves enough to hunt for food. Loaches need plenty of free swimming space to compliment their playful behaviors. Different species of fish have their own unique needs; the key is to find fish that can coexist in an aquarium where all of their requirements can be met. Have the sales person recommend which species of Fish are ideal for beginner aquarists. Most likely, if you have never had an aquarium before and you want something somewhat low maintenance they will recommend that you do not get a saltwater tank with marine fish because they are harder to care for and require more knowledge of technical details than a freshwater Aquarium. They may recommend that you start with a Gourami or Guppy because they are hearty fish that are fairly inexpensive and easy to care for. Another reason they might recommend the Guppy or Gourami is that they are relatively small fish who produce less waste. An inexperienced aquarist may do great taking care of larger fish such as Cichlids that are very hearty but the maintenance is more time consuming due to the amount of waste produced by these big eaters. There are more water changes and aquarium cleanings involved in their care but I say: if you have the time to dedicate to your hobby then who’s to stop you from having Cichlids? There are three general layers in every Aquarium. Some fish are top swimmers while others like to hang out in the middle and the remaining are bottom dwellers. Some of the common fish in each level are: bottom dwellers such as Loaches, Catfish and Corys, middle swimmers like tetras and angelfish, and top inhabitants including hatchet fish and four eyed fish. Be sure not to overstock your tank with too many fish in each level or you will have territorial disputes to the death in your aquarium. When you think about how much you want to spend on an aquarium you should try to get the largest tank you can afford. Larger aquariums are always a little easier to keep stabilized than smaller ones. Fish eat, sleep, and live in the same water as they excrete their wastes into. In a smaller tank the waste will quickly become quite concentrated of contaminations. If not cleaned very frequently it will lead to very ill fish, inevitably resulting in death. Having a larger area of water will allow you to do partial water changes every week or two without having to worry about chemical build up and the declining health of your fish. The size of the fish at the time of purchase should not be the determining factor of how large a tank you should purchase. Some fish can be purchased at deceivingly small sizes and then grown to be too large for your aquarium to handle. Keep in mind the size your fish will be when reaching full adult maturity. Guppies will stay small, reaching a mature size of 2.5 inches while the Oscar will reach up 12 inches long. Needless to say the Oscar will require a larger tank than the guppy after a few months go by. Another thing to think about is how many fish you will want to raise. This should also be a contributing factor in how big an aquarium you should purchase. If you want just a few fish you may only need a 10 to 20 gallon aquarium. 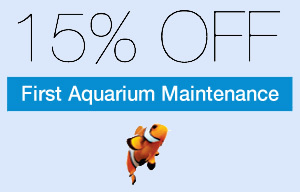 If you want a lot of fish then you might want to consider a 55 gallon aquarium or larger. If you already have an aquarium that you would like to fill then there are some loose guidelines to follow. For every 12 square inches of surface area in a freshwater tank you can add 1 inch of fish into the aquarium. So if you have a 29 gallon aquarium you will only want up to 30 inches of fish residing in your tank. This does not mean you should go out and buy one fish that is 30 inches long. If you have 15 guppies that are 2 inches long then you are at full capacity. For a coldwater tank you could have 1 inch of fish for every 30 square inches of surface area and for a marine aquarium you should have 48 square inches of surface area per 1 inch of fish. Remember that these are not very strict guidelines Just use good judgment when deciding how to maximize the full potential of your tank space. Once you determine what size aquarium you want to keep you will have to find the right filtration system. The purpose of a filter is to clear debris and harmful chemicals from the aquarium, and also to re-oxygenate the water. You will want to choose a filter size according to the amount of water that your aquarium can hold. You should always keep in mind that they type of fish you keep may require more filtering power than normally recommended because of the amount of waste produced. In that case you should get a filter that is larger than recommended for you aquarium size or you can add a second filter. The three types of filtration include mechanical, biological and chemical. Most store bought filtration systems will provide all three types of filtration. The mechanical filtration requires the polluted water to be pushed through a sifting substance which will remove the debris replacing clean water back into the aquarium. Biological filtration consists of different types of bacteria whose job is to metabolize and convert chemical wastes. Chemical filters utilize activated carbon crystals to remove the toxic chemicals metabolized by the bio-filter. This whole system works together in order to provide a clean and safe environment for your fish. As the water gets pushed out of these multifunctional filters it is flows back onto the surface of the aquarium water. This is where the gaseous exchange of oxygen gets replenished into the tank once again. The key is to have movement on the surface of the water so that the atmospheric oxygen can diffuse back into it. The more surface area of water exposed the better. That is why it is more practical to have a low wide tank instead of a tall narrow one. Air pumps can be used to diffuse oxygen into the water. This is very important for the respiration of fish and the nitrification bacteria if the filtration device does not provide the aquarium with an adequate supply of oxygen. Without enough oxygen your fish become hypoxic which will eventually result in death. Adding live plants into your tank will help to increase the oxygen levels naturally. Keep in mind that saline and heat decreases oxygen levels so you will want to monitor those levels carefully. Temperature plays a big role in the health of an aquarium. Whether it is fish, plants, or invertebrates, every creature has an optimum health temperature. When assembling a community of fish you will need to choose them according to the optimum water conditions that they require. Most aquariums will need an artificial heater to maintain consistent temperatures throughout colder seasons. Some aquariums will need a heater year round and others may only need it for treating illness in the tank. Depending on how much you need to raise the temperature and how big your tank is, you will have to find out which heater is right for you. Heaters come in a wide range of wattage and size so you will have to choose one based on your needs. Heaters come in as low as 25 watts for heating as little as 5 gallons of water to 300 watts for heating up to 75 gallons of water. Titanium heaters are available for any tank that is larger than 75 gallons for sufficient and accurate heating. Lighting also plays a crucial role in the aquarium. It provides ambiance to create a certain look and feel in the aquarium. You can get different colors or wattage to compliment your fish and plants. Choosing the right light may allow your plants to grow while choosing the wrong lighting can result in algae blooms. The most common aquarium lighting is fluorescent tube light bulbs. They last a long time, use up less electricity and they are great for the growth of plants. Moon lights are also available for overnight lighting. They allow you to see fish at night without casting a disturbing brightness over the tank. The lunar light creates just enough of a glow to allow nocturnal fish to be observed at a time when they would naturally be out and about. Lighting timers are also available and can be an enormous asset to the aquarium. Just as the sun goes up and down in close to regular intervals each day, you can have a timer mimic the cycle of day and night. Program the timer to turn on and off for a consistency your fish can appreciate. Decorating an aquarium starts with choosing the substrate which is the materials used to cover the bottom of the tank. Having substrate not only serves as a decoration for your beautiful underwater environment, but it also helps to cultivate the beneficial bacteria and keep the fish oriented. If the bottom of the aquarium is not covered the glass will reflect what is going on in the tank and the fish can easily become confused as to which way is up. Substrate can be all types of different substances. Gravel is the most common substrate found in freshwater aquariums and sand is the most common substrate found in saltwater aquariums. The substrate in your aquarium should be 2 to 2.5 inches deep, which is a great depth for bacteria to form a colony. If the substrate is too shallow it will not be helpful in anchoring plants, if it is too deep then food and waste will get trapped beneath allowing dangerous chemical build-up to form in the tank. When choosing a substrate you should think about how it will work with your tank setup. If you have sucker fish you should use gravel instead of sand to allow the mouth of the sucker fish to have something to suction to. If you have flounders you should use sand instead of gravel because they need to blend into the bottom surface to feel safe. Be sure to also realize that different substrates require different maintenance techniques. Sand is harder to siphon because it is so fine and will easily be removed with the water which is something you definitely do not want to happen. Gravel may require more siphoning because more waste and chemicals can get trapped within it. In addition to gravel and sand there are a number of different substrates to choose from. Glass marbles or gemstones could be added to the aquarium to add color and reflective light. The only problem with that is fish tend to get irritated and stressed by the refracting light. River stones are larger than gravel but not quite big enough to build caves out of. They can provide a unique look to your aquarium but it might be best to lay a thin layer of sand or gravel under the stones to prevent them from cracking the glass. Nutrient rich substrates are also available for planted tanks. This substance provides fertilization to help plants thrive in an aquarium setting. Plants, shelters and backgrounds provide security for your fish. Since they are naturally shy creatures, fish tend to want to hide when they do not feel safe. Providing your fish with adequate hiding places will help them to become comfortable in the aquarium and they will eventually start becoming more social. There are many different plants to choose from when you first start putting you aquarium together. First of all, would you like live or artificial plants? This is a very important decision because live plants will determine a number of other features in your aquarium. Some fish like to dig up plants so you will want to get hearty plants that will not be damaged. Plastic plants would probably work best in this situation. Artificial plants lend an aesthetic quality to the aquarium without altering the quality of the water. This can be a great thing to a new aquarist who is just starting out. Choosing to utilize live plants can benefit your aquarium greatly if you are up to the challenge. If you have enough live plants in the aquarium you may not need to do anything more to chemically filter or re-oxygenate the water. The plants will naturally do that for you but you may need to provide the plants with enough carbon dioxide to thrive. If you choose to have live plants and no filter you will need to perform frequent water changes to remove the debris from food, waste and dead plant matter. Remember that live aquarium plants require gardening just as regular plants do. Choosing a background is purely a matter of preference. The main purpose of a background is to hide unsightly wires and filter tubes that may run along the back side of the aquarium. Backgrounds come in 2 and 3-dimentional displays, with different scenery or colors but what is looks like will purely depend on what is pleasing to your eye. 3-D backgrounds are often made of sponge and sits inside the tank water. This is yet another place that beneficial bacteria can live so it may be an asset to the aquarium. However, a this background is also a breeding ground for algae and can be harder to clean. This can result in more pollution in the tank than most aquarists would like. 2-D backgrounds are secured to the outside of the rear glass wall of the aquarium. There is little to no maintenance involved in taking care of this backdrop. Some people like to see planted, rocky backgrounds to add more depth to the underwater scene, while others like to display a solid blue background to let the striking colors of the fish speak for themselves. The fish will never notice either way. When the aquarium is set up, the bacteria is established and the decorations are all in place it is finally time to acclimate your fish into the aquarium. The most important thing to remember is never to just dump the whole bag of fish and fish-water from the aquatic retail store directly into your nice, new, clean aquarium. Taking the time to acclimate your fish could be the best thing you can do for your aquarium because new environments can be very stressful on fish. As you know, stress leads to weakened immunities and fish are more susceptible to disease when they are stressed out. Before adding a fish to a new aquarium it is a good idea to float the bag on the top of the aquarium for about 10 minutes, at which time you will add a little bit of your aquarium water to the bag. After 10 more minutes remove more water and replace the volume with supplementary water drawn from the aquarium. After 10 minutes repeat the process once more and leave for 10 more minutes. Using an aquarium net, place the fish into the aquarium and discard the water from the bag. Do not pour the water back into the aquarium; either pour it down the drain or out into the grass. After setting up your aquarium your new hobby is just starting. There is so much to learn being an aquarist never gets boring. You will constantly discover more about finding or maintaining an aquarium or aquarium equipment.